Get the whole bunch of data recovery tools for the price of one! With Hetman Data Recovery Pack, you receive a bunch of tools to help you handle any data recovery job you may ever encounter. Free priority support, attractive licensing and unbeatable price make Hetman Data Recovery Pack the perfect choice for homes, offices and service providers. Bundle up! A bunch of data recovery tools is available for the price of one, with one year of free priority support included to help you get the most out of every tool. Customer care is our top priority. By ordering the bundle, you'll have your questions answered with top priority. Not only that, but we'll provide assistance with your particular situation concerning a data recovery job. A dedicated specialist will assess your situation and guide you through the recovery process from recommending the right tool to helping you use it the right way. We are happy to provide priority customer support over the phone and by email. Whether you need to recover a home PC, run a data recovery business or need to protect your office computers against data loss, Hetman Data Recovery Pack is perfect for you. You may use the different tools from the bundle on the same computer or on different computers at home and in the office, allowing you to equip your entire organization with quality data recovery tools at no extra cost. Order Hetman Data Recovery Pack and receive the latest versions of all data recovery software at no extra charge! The bundle offers free updates to all bundled products if you pay to update only one. What do you like better: an all-in-one data recovery solution, a simple wizard-based undelete tool, or a highly specialized application to fix your specific problem? With Hetman Data Recovery Pack, you'll never have to guess! 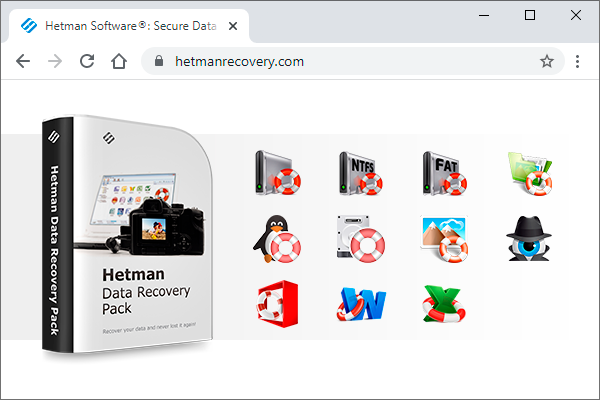 By getting all Hetman data recovery tools pre-packaged into a convenient bundle, you'll be able to choose the most appropriate tool to handle each data recovery situation.